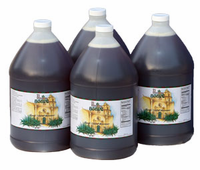 Premium Bulk Vanilla Agave (4) 1 gallon bottles (NET WT 48 lbs) $0.14 per Oz. Vanilla Agave - Vanilla extracts are blended from different growing regions including Madagascar, Mexico, Indonesia, and Tahiti. Formulated for optimal flavor balance when added to coffee, espresso drinks, sodas, desserts, and culinary specialties. 21 Missions Agave Syrups are the proven, easy way to create your own taste sensations. Our Flavored Agave Nectar is blended with only all-natural flavors.